Imagine a place so green, lush, and human-less it feels like you stepped back in time to the Jurrasic period. Picture glaciers so big they stick out like giant scars on the mountains hundreds of miles away. Can you picture such an amazing, adventurous place? I’ll be honest. When my fiance (now darling husband) and I booked our honeymoon to Alaska, I wasn’t expecting anything that incredible. I mean I knew we were in for a treat. A huge adventure. Everyone know’s Alaska is the Last Frontier, the place for adventure seekers. But I’m still in awe of how incredible it was to explore even just a tiny part of it. That’s what LITERALLY everyone said to us. Which is fine. Most normal people do go on a cruise to Alaska. But Jonny and I aren’t normal. We like exploring at our leisure and leaving the crowds behind! Jonny and I had never been to Alaska, but it was on both of our travel bucket lists. We did some research on where exactly we wanted to go and Juneau seemed perfect for us. It had lots of hiking, kayaking, and giant BEAUTIFUL glaciers. We booked our flight and our Airbnb in February, five months before our wedding. We waited, and waited and waited and finally our wedding day and Alaskan departure came! Our honeymoon was nothing short of perfect. 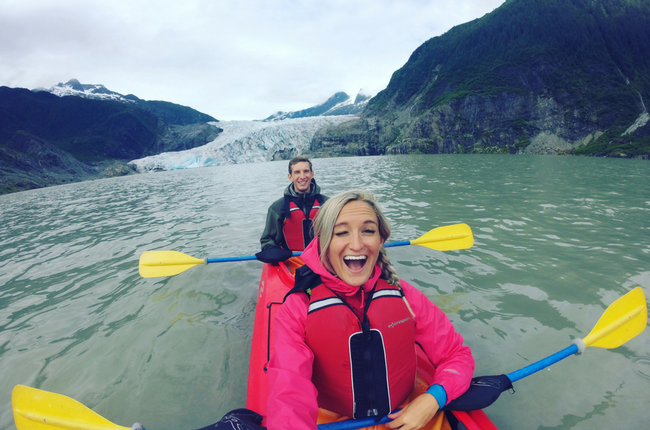 If you’re thinking of planning a honeymoon or vacation to Juneau, then here are my top tips to make it the best. Unless you like being stuck in tight quarters with tons of strangers, don’t choose to see Alaska via cruise. In my opinion, you can see and do much more if you choose to stay in one or two locations. We stayed in a cozy Airbnb right on lake Mendenhall. It felt like we had our own little place right in the Alaskan woods! Perfect for a romantic honeymoon! We would drive a short distance to go hike or kayak then come home and snuggle up with some hot cocoa. No cruise agenda for us! It rains in Alaska, A LOT. At least in Juneau it does. (239 days each year they get precipitation). There’s a really good chance you’ll get rained on while you’re visiting, and if you’re prepared for it that’s ok! Rain makes things dreamy, mystical, and more romantic anyway right? I mean, have you seen The Notebook? The best thing you can bring so you can enjoy the rain is a good pair of waterproof hiking boots and a waterproof rain jacket. I didn’t bring waterproof hiking shoes and my feet got soggy pretty much every day. It wasn’t that bad, but if you prefer to have dry feet, invest in some shoes! 3. Have a Spirit of Wanderlust. If you’re not the adventure seeker type, then maybe Alaska won’t be that fun for you. For me and my hubby, it was perfect because we love adventuring. We love hiking and exploring and there is plenty of that in Alaska! I know it sounds dumb and cliche, but there really is something romantic about going to a nice restaurant for dinner. We chose a restaurant at the top of Mount Roberts, only accessible by tram. It probably sounds fancier than it was, but it was fun to treat ourselves to a classy meal, especially after a long day of hiking! This one should be easy, but it can be easy to worry about leaving work behind, what’s you might miss on social media, and what wedding presents you got. My advice is to turn your phone on airplane mode (which I barely had to do because most places we went were out of cell coverage) and leave real life behind. You only get one honeymoon, so make the most of every moment! It was so incredible to explore a new place with my favorite person. We made so many happy memories and each day was a treat to be together with no schedule to stick to and no jobs to stress about. Have more questions? Leave a comment and ask! I’d be happy to answer them.